Why I recommend you come to visit Batam is because of it strategic location among the 3 countries: Indonesia, Malaysia and Singapore. 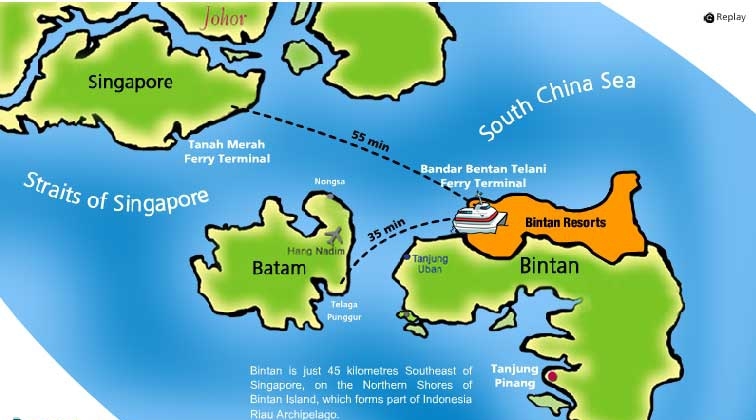 You can visit Singapore or even Malaysia then come to Batam if you want continue to explore the very large Indonesia land without more documentations you can visit this small Town it is so close with another nice destination: Bintan Island after that you free to explore Riau Island if you want it. It is 1,595 km². It included Rempang and Galang Islands located in the Singapore strait, it is really close to Singapore if the boat can runs with more speed it can be reached less than 25 minutes. But there any regulation put for speed limit with reasons. It is still owner of Riau Archipelago Province region. The weather is 28 °C, with 75% humidity, with speed of south wind direction is 21 km/h. The central of the town is admintrative city of Batam Center. No worry about food, Batam does have many food shop, restaurants and coffeeshop. They are International taste food serve. People can easliy find food in the malls in Nagoya, Batam Center, airport, and ports when you first time visit. If you choose 3 stars hotels rate, you can pay just for IDR.389.500,- and if you choose 5 stars hotels rate you must pay IDR.2.700.000,-. You may search them in Google search: i-Hotel, Panorama hotel, Planet Hotel or even resorts where you want to spent your nights. Also no worry about transportation in recents, people can call any online transportation as it is availlable in most countries in town. Hotel usually provide transportation for service their costumers.